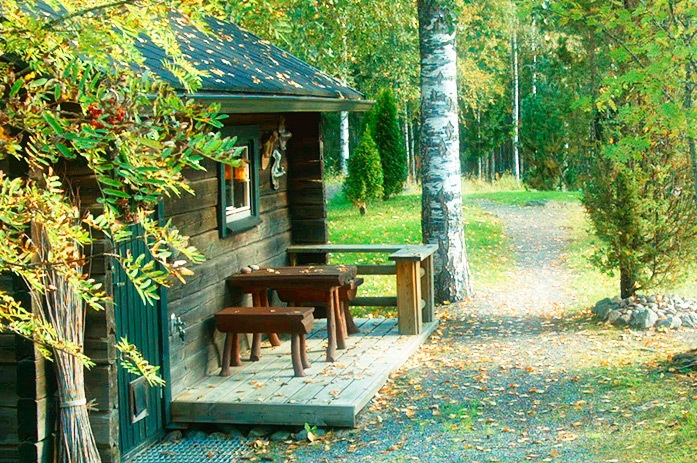 Sahakoski Cottage is a natural place for conferences and relaxation yet easily accessible close to Ahlainen village, in Sahakoski. You can find the cottage and its beautiful surroundings on top of a hill, close to the Ahlaistenjoki river bridge. 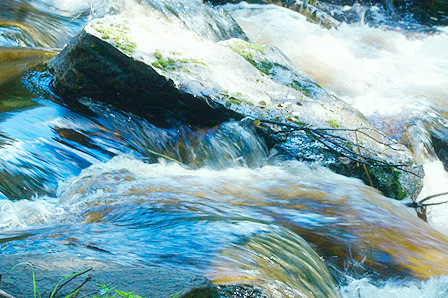 The smooth roaring sounds you hear come from the Sahakoski rapids nearby. We will organize your meeting, conference or another event easily and functionally in a relaxed place with a unique wildlife atmosphere. 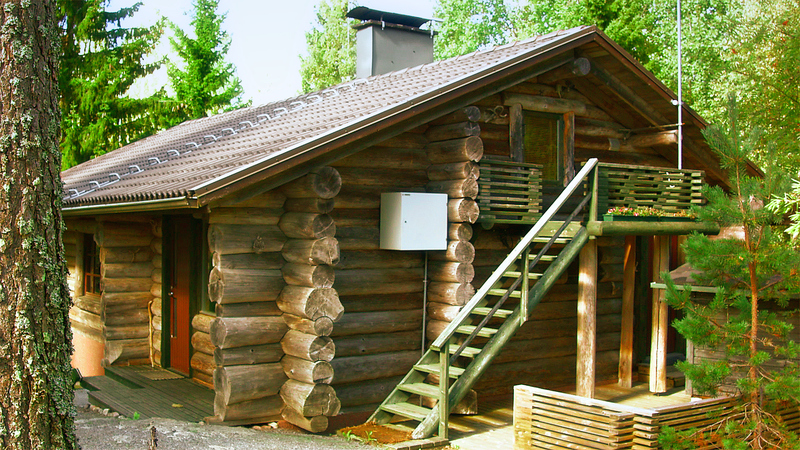 The Cottage itself is built of impressive large brown logs. In the middle of the main room, there is a beautiful plank table with benches, hand crafted by a professional carpenter especially for the Cottage. Unique old wooden movie theatre benches provide extra seats – altogether the room has a seating for 25-30 people. The main room has a comfortable couch, a private sleeping corner with a special hay pole decoration and a spacious balcony. 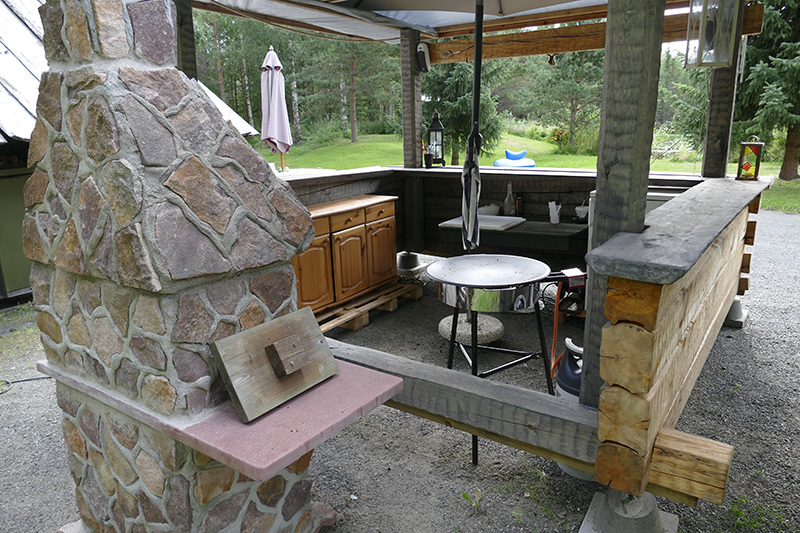 Outside in the yard, by the pond, you can find a traditional sauna and an atmospheric chimneyless sauna. The pond gets its pure water from three natural springs and you can swim in the pond both in the summer and in the wintertime. By the pond, there is also a massive log swing, a cute log cabin and a small gazebo on the top of the rock. You can find also many other nice places for relaxation near the river or in the shade of the forest. By the several campfires and barbecue stand you can warm up and enjoy the various special delicacies such as coffee from a smoky coffee pot, crepes, fish cooked on an open fire, sausages and meat from quarry as well as other wildlife food such as mushrooms, berries and herbs. Ahlainen area has many possibilities for expeditions: the seaside, river deltas and rocky forests with functional pathways and roads. You can walk, take a bike ride or do some kayaking. 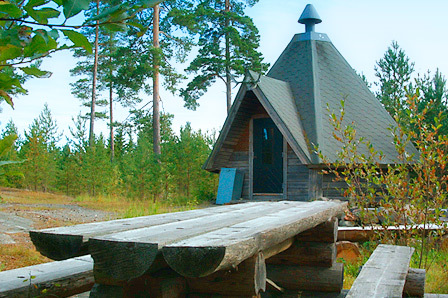 Close to the Cottage you can find the archaic Hiidenkallio stone mound burial site and a few kilometres further the Hunting Cabin of Karhukorpi, the Hööpäkki Lean-to and the Kirkkoniittu Laplander’s Hut near Peittoo wind farm. Other near-by spots of interest are Onnenkoski cafeteria and souvenir shop with some hiking routes starting from its yard, the historical Ahlainen village with a beautiful wooden church and a route with seven bridges, with stunning views, leading to historical Reposaari island area, famous especially among the bird watchers. There has been a sawmill above the rapids already a hundred years ago. The current sawmill was built in 1950 when family Savunen bought the place. In earlier days, before the current sawmill and mill, another mill and a varnish factory used to stand there. The hydroelectric power plant was built in 1958 (along the mill) and is still in function with its small generator. Nowadays the river and the rapids are well known to many fishermen and kayakers – though the main rapid is too steep to enter.